1985 Birth in the U.S. Informed? or Performed? Passionate Journey, My Unexpected Life was published in June 2011. 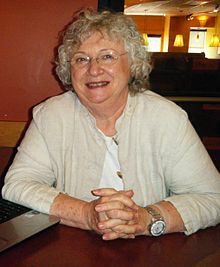 Marian Leonard Tompson is one of the seven founders of La Leche League International. She was President of La Leche League for 24 years, from 1956 to 1980, and a member of the Founders Advisory Council. Wife of the late Clement Tompson, she is the mother of seven children, a grandmother and great-grandmother. An early advocate of home birth, four of her children, and many grandchildren and great-grandchildren were born at home. Mrs. Tompson was instrumental in developing Breastfeeding Seminars for Physicians hosted regularly by La Leche League and held annually since 1973. She has served on many boards, committees and advisory councils, including the International Advisory Council for the World Alliance for Breastfeeding Action (1996 to present). ; the Advisory Board for the National Association of Post Partum Care Services (1995), the Advisory Committee for Perinatal Health, Department of Public Health for the State of Illinois (1983); and served as a consultant for the WHO/UNICEF meeting on Infant and Young Child Feeding in Geneva, Switzerland in 1980. Mrs. Tompson is an engaging speaker, often representing La Leche League at local, national and international conferences, traveling to more than 20 countries in doing so. When questions and concerns about breastfeeding and HIV/AIDS arose in the late 1990s, Mrs. Tompson began to ask questions about the available research. This resulted in AnotherLook at Breastfeeding and HIV/AIDS, a nonprofit organization founded in 2001 dedicated to gathering information, raising critical questions, and stimulating research about breastfeeding in the context of HIV/AIDS. She is President and CEO. In 2010 Marian Tompson was asked by Dr. Thomas W. Hale of Hale Publishing to write her memoir, with the assistance of Melissa Clark Vickers. Passionate Journey, My Unexpected Life was published in June 2011.